Solar Thermodynamic Heating is a technology that may sound complicated, but is in fact a simple and energy efficient process of heating domestic water using the natural, clean and free energy of the surrounding environment. Unlike conventional flat plate solar panels, solar thermodynamic heating systems do not require direct sunlight and can produce heat no matter what the weather conditions, come sun, rain, cloud or night, 365 days a year. Solar thermodynamic panels can even produce heat and hot water in the snow – although it takes a little longer to heat the water. So how do these solar thermodynamic heating panels work. Conventional solar heating systems circulate water through glass panels known as collectors to collect the heat from the sun. While these solar hot water heating systems work very well for many home owners, they are by their very design inefficient at low temperatures as their use is directly linked to the climate and their amount of exposure to the sun. Also, they are limited in their hours of operation as they do not work at all during hours of darkness, including the latest evacuated tube type collectors. As its name suggests, “Solar Thermodynamic Heating” works on the principal of thermodynamics, which comes from the Greek word meaning “heat motion” and the laws of thermodynamics state that energy can neither be created nor destroyed, it can only change from one form to another. So energy in the form of heat can be transferred between two different bodies (or a body and its surroundings) by virtue of a temperature difference. That is, a heat energy interaction only takes place if there is a temperature difference. Then it follows that there cannot be any heat transfer between two systems that are at the same temperature. For example, the contents of a cold fizzy drinks can in a warm room will eventually warm-up to the same temperature of the room as a result of heat transfer from the room to the drink through the aluminium can by a process of conduction. The same is also true with thermodynamic solar energy, that works on the simple principle of capturing and exchanging energy, in this case heat by utilising a special eco-friendly refrigerant instead of water. Highly energy efficient thermal solar panels which are more like a cross between a solar thermal panel and an air source heat pump are used to capture the surrounding heat which in turn is used to heat water for space heating or for domestic hot water inside your home. Working like a refrigerator in reverse, an eco-friendly refrigerant with good thermodynamic properties, such as a R-407 mix, is pumped through the thermal absorber, called a collector, as a cold pressurised liquid. As it circulates inside the collector it absorbs heat energy from the surrounding atmosphere that has warmed the collector plate and as the temperature of the refrigerant liquid increases, it vaporises changing the refrigerant fluid into a gas. When the gas leaves the collector plate it is very warm but the gas passes through a compressor and is heated further by the action of the compressor, just like in a heat pump. As it circulates around the system, the now hot gas flows through a heat exchanger coil, called a thermodynamic block, inside the water cylinder were the heat is transferred into the water via the heat exchanger. As the gas transfers its heat to the water, it cools reverting back to a liquid state and flows back to the solar panel were the process is repeated. So the cycle of the refrigerant is to enter the solar collector as a cold liquid and exit as a gas, pass through a compressor to concentrate the heat and pressure in the gas, just like in a heat pump, and then pass it through a heat exchanger which extracts the heat to heat water as the refrigerant returns back to a liquid. Generally the refrigerant is continually circulated with the aid of the compressor pump and an external electrical source to keep the temperature difference almost constant during both the heat absorption (evaporation) and release (condensation) process helping to improve system efficiency. Using a refrigerant gas in the solar collectors instead of water is the secret to the success of the solar thermodynamic heating system. The theory is that this makes it more efficient than traditional solar thermal panels, particularly when there is no direct sunlight allowing for a far higher efficiency at a much lower ambient temperature than conventional water filled solar panels. But the biggest advantage of a solar thermodynamic heating system is that unlike traditional solar collectors which must be mounted on a roof in direct line of sight of the suns energy, thermodynamic solar collectors can be mounted anywhere, vertically or horizontally, in or out of the shade as its the surrounding ambient temperature they need and not direct sunlight. Also, as the thermodynamic solar collectors are full of a refrigerant gas and not water, they also weigh a lot less too. 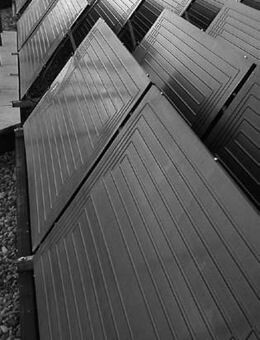 As well as being able to produce hot water at up to 50oC in the shade with a very high efficiency and low energy consumption, solar hydrodynamic heating systems are now being used for underfloor heating and radiator systems in many new homes as they are capable of extracting sufficient warmth from the atmosphere to heat a building to a comfortable temperature even on the coldest of winter days. Thermodynamic solar panels can even be used to heat your swimming pool all year around. Solar thermodynamic heating is a new and exciting way of producing free and clean hot water without the need of large, bulky or heavy roof mounted flat plate solar panels which may freeze in winter. Solar thermodynamic heating panels are gaining popularity today since many people are making a concerted effort to go “green” in order to save money and the environment. These solar thermal heating systems are an important use of solar energy and the installation of this type of heating system allows people living in colder northern climates to benefit from the energy contained within the outside ambient air all year around. Then an energy revolution is under way in how we heat our water and solar thermodynamic heating is becoming a major player thanks to its special heat pump and simple system design. To learn more about solar thermodynamic heating and how you can use it to heat your water and your home, or to obtain more information about the various thermodynamic solar designs and systems available, or to just explore the advantages and disadvantages of using thermodynamic heating systems, then Click Here to order your copy from Amazon today about how solar thermodynamic heating systems can be used in your home. I would like to find a Canadian distributor of Thermal Dynamic panels for heating water. The kind that use the refrigerant. Due to my aforementioned doubt, I would appreciate explanation on the use of a compressor to increase the temperature of the fluid? Very interesting would like to know more ,about the thermodynamic water heating panels,and accessories if any. Area required, and if external power requirement for compressor to run higher water temperatures in winter.I am in INDIA 20 LATITUDE NORTH. ALREADY HAVE 6K PANELS WITH 6K PCU, Grid assist.& BATTERIES FOR BACKUP. I do not intend to use GRID, FOR WATER HEATING. Nice alternative energy tutorials. I agree with your points. Keep posting.